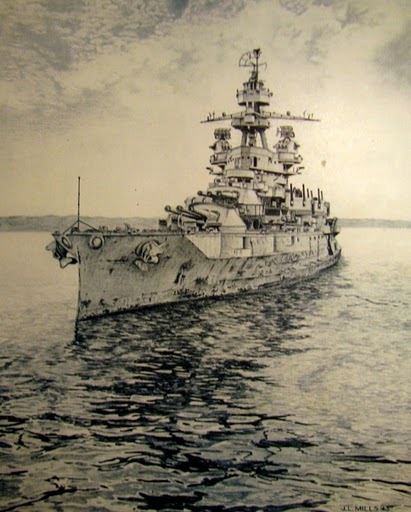 Drennon Judy was a quartermaster who served aboard the Battleship USS Pennsylvania. 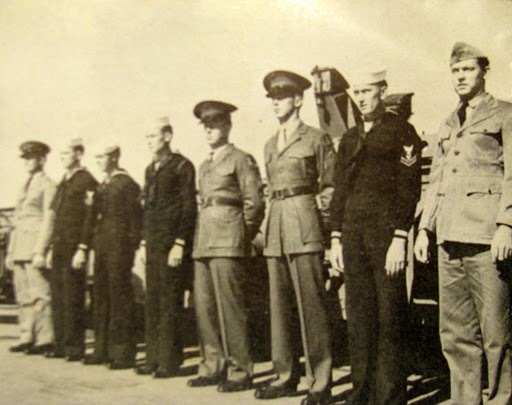 He saw action during many of the major battles in the Pacific during World War II. Judy was on the bridge and sometimes steered the dreadnaught into battle or handling the ship’s log at: Kwajalein, Eniwetok, Saipan, Tinian, Guam, Peleliu, Angaur, Leyte, Lingayen, Wake and Okinawa. Hours after war with Japan ended on Aug.12, 1945, he was almost killed aboard the Pennsylvania when a lone kamikaze torpedo-bomber attacked the battleship while it rode at anchor in Buckner Bay off Okinawa. The suicide plane blew a 30-foot in diameter hole in the stern of the ship near where Judy was working below deck. ‘”About an hour before the kamikaze attacked it came over the ship’s loud speaker that the war was over. No one was expecting to be attacked when the bomber dropped its torpedo that struck the Pennsylvania,” the 86 -year-old Port Charlotte, Fla. resident explained. 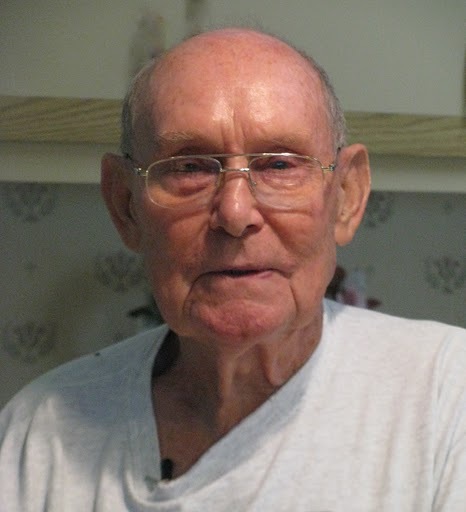 “If I had remained in the quartermaster division steering the ship and writing the log I would have probably been killed at Okinawa during the attack,” he said. “All 20 sailors killed in that attack were in the quartermaster’s compartment when the torpedo struck the ship’s fantail where they were. “I had been reassigned as an electrician’s mate and was working a deck above in my quarters when the torpedo blew a 30 foot hole in the back of the ship. I ended up with some shrapnel injuries from the blast. I managed to escape in the dark down a corridor to a ladder and hatch that took me to the deck. I spent the next few days wearing only my shorts aboard ship because that was all I had,” Judy said. He and a half dozen other sailors aboard the Pennsylvania each received Purple Hearts because of their injuries. The Pennsylvania sunk by the stern where she was anchored in Buckner Bay. Three seagoing tug boats arrived and lifted her off the bottom while a salvage crew aboard ship pumped the water out of the waterlogged battleship. “We kept her afloat until we could get her back to a dry dock at Guam for temporary repairs. A giant steel patch was welded over the ship’s gaping hole caused by the torpedo,” he said. “These temporary repairs were to be sufficient to get her back to the U.S.
“The captain of the ship decided to sail her back to the States alone. 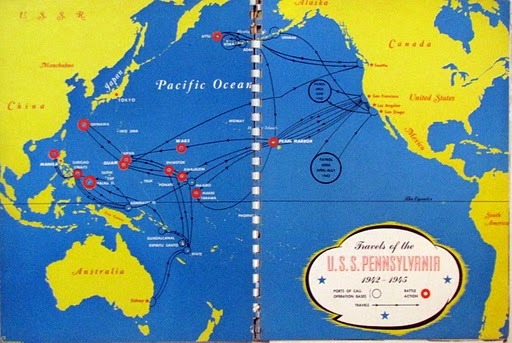 Half way across the Pacific a Japanese sub started following the Pennsylvania. It apparently didn’t know the war was over,” Judy said. “The enemy sub disappeared and was never heard from again. On another occasion, while Judy was steering the ship, he recalled an incident during the Battle of Leyte Gulf. If involved an enemy torpedo, the captain of the Pennsylvania and Judy. “The fleet was coming in Leyte Gulf. The destroyers went first, then came the cruisers and finally the battleships. About the time we came into the gulf a kamikaze attack struck the fleet. Enemy fighters and bombers swept across the fleet and each successive ship began firing at the Japanese fighters and bombers,” he said. “We could see an enemy torpedo coming right toward us and the captain gave the wrong order. If I had followed what he said I would have turned into the oncoming torpedo, but I didn’t,” Judy explained. “I was at the helm, caught his mistake and turned the ship the other way. The Japanese torpedo missed our stern by a few feet. The skipper never said a word to me. “We shot the plane down that dropped the torpedo that just missed us. It hit the water so close to our ship that it splashed water on the battleship’s deck,” he recalled. Judy didn’t steer the ship with a wheel. Like thousands of other sailors, Judy returned home to St. Louis, Mo. aboard a slow moving train. He went to work immediately and after several jobs bought an automotive shop and eventually ran with a staff of four for 35 years until retiring. In the late 1980s he and his wife, Betty of 62 years, moved to Port Charlotte. They had two children: Vicki and Dale, a couple of grandchildren and 10 great-grandchildren, all boys. All personnel attached to and serving on board the U.S.S. PENNSYLVANIA during the above period are hereby authorized to wear the NAVY UNIT COMMENDATION Ribbon. This story was first printed in the Charlotte Sun newspaper, Port Charlotte, Florida on Monday, July 11, 2011. It is republished with permission.